Kengo's father was celebrated woodcarver Masamitsu Takiguchi. 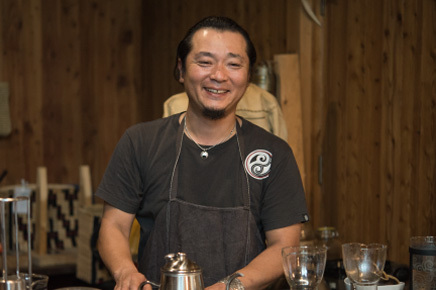 Kengo watched his father work from early childhood until his death in April of 2017. Once, when he was cleaning his father's workshop, he stumbled on something special.Kengo has a sister. One of his father's pieces, carved around the time she was born, is a statue of a woman holding an infant. Small children's faces were carved hovering around the woman's head like clouds. "He'd carved another of the same statue 5.6cm tall, and placed it carefully on the Buddhist altar in the workshop. When I finally got mother to talk about it, it turns out she'd had a history of miscarriages, and I should actually be one of five siblings. We guess that when father realized this, he thought about it and expressed his feelings in his own way, in a carving." When Kengo returned to Akan and began carving, his father never pressed him on carving style or technique. "But one thing he really drove home was sharpening my tools. 'Sharpen it, now show me...' And he never seemed satisfied. But after I kept it up for a while, he stopped saying anything about it, so I guess I learned how to do it right! "Now that I think about it, father used to carve with an air chipper, but he never let me touch it. He said I had to learn to carve with a chisel first, and then I could use machinery. 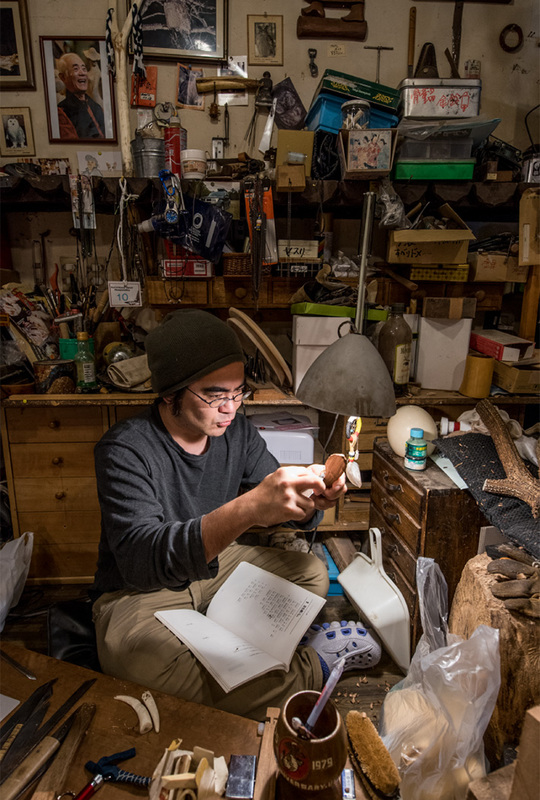 "Kengo also talks of trying to emulate his father's unique style in carving things like the lay of feathers on the owls he carved. "I'm still not really sure myself about the meaning or anything behind my own work. It's so hard. But I do want to be able to transform ideas into my own work, I guess. Of course, the things I tried based on father's work, with some changes, sell really well. But I guess first of all I just want to get better. " It's been five years since Kengo returned to Akanko Ainu Kotan. 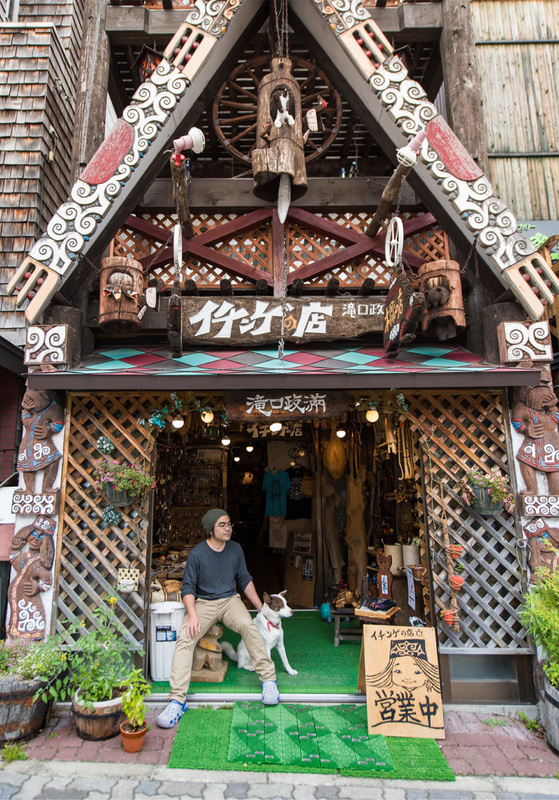 His father left him the shop Ichinge no Mise, and there he carves his art, connects with customers, and spends his leftover time studying Ainu culture. 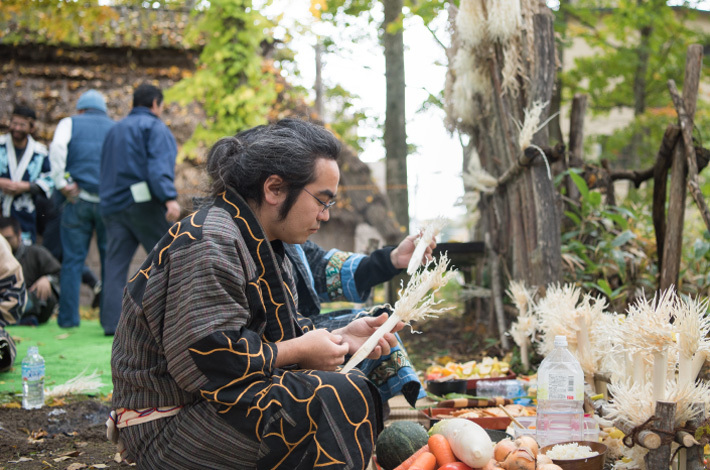 He's learning the Ainu language, and takes part in sacred kamuynomi ceremonies to offer prayers to the Ainu deities. 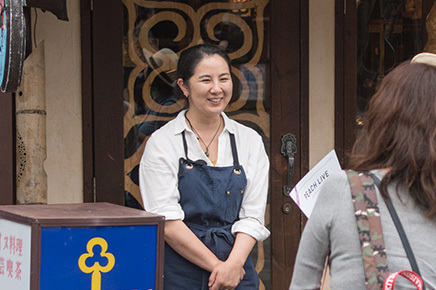 "When I first came back to Hokkaido, I joined a kamuynomi at Takikawa and I was really surprised. I'd thought it was so cool, but then suddenly I started crying. Everyone was there around the fire, chanting prayers in Ainu. I was really moved that there were so many people who could speak the language. Now I'm getting someone to teach me, and reading books, and I can finally use it, too. 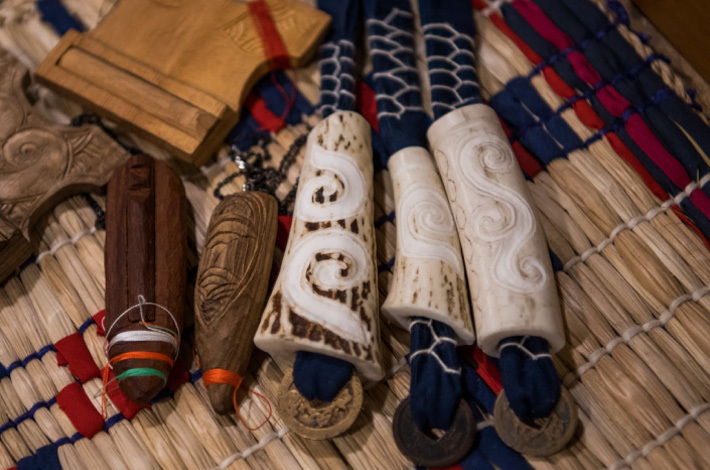 "A set of long chopsticks called pasuy are used in sacred rites to offer sake up to the gods.When he found out that his Ainu elders all had special personal pasuy, he become fixed on the idea of making his own to use at the kamuynomi himself. 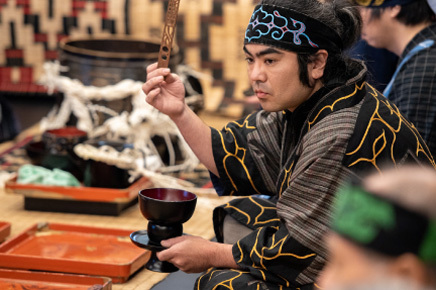 He feels like his work has become something different after he began learning Ainu culture and joining dances and kamuynomi. "I feel like 'saying things' and 'making things' are walled off from each other inside me. But now they seem connected in a weird way. 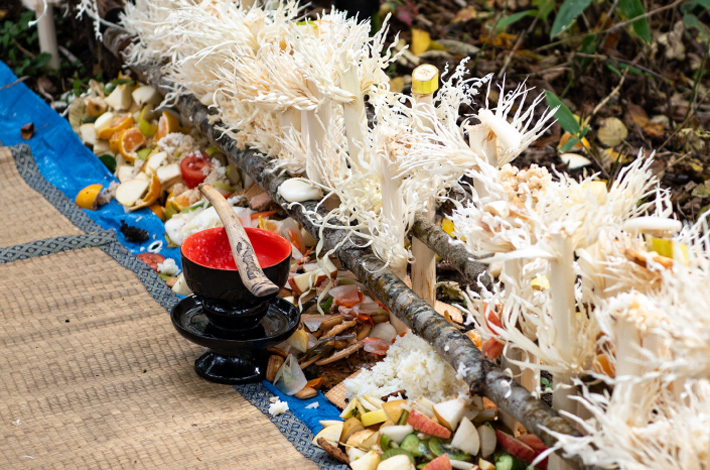 "The connection came when he was making an inaw [shaved wood stick], an item believed to bridge the gap between humans, and the kamuy or ancestors.When he was making an inaw with the elders for use in the new year's kamuynomi, called asirpanomi, his hands suddenly stopped. He found himself suddenly unable to shave the wood correctly. "The people around me all said I'd suddenly be able to do it. They said it would be like the kamuy coming to me. "Because an inaw must be offered up to the deities, it's not something you can practice making. It doesn't matter whether they're well-made or not, they all go to the altar. "I've gone to all kinds of places to make inaw, and no one has ever gotten mad at me for being bad at it. 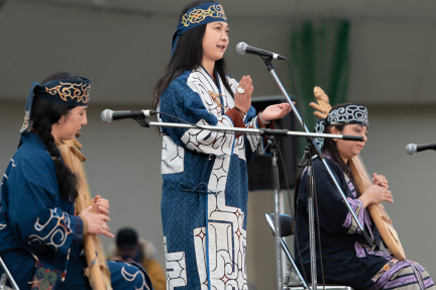 Everyone just says it's the feeling that counts, so it's OK. "He was uneasy about the inaw that he suddenly found himself unable to make being offered on the altar, but that itself was another lesson in the Ainu way of thinking. "I'm interested in buying some unusual materials to try carving them. It's interesting because the blade behaves totally differently based on the material. "He wants to try different things, like making pasuy from African wood, or seeing what he could make from animal bones, cattle horn, or things from recycled wood shops. 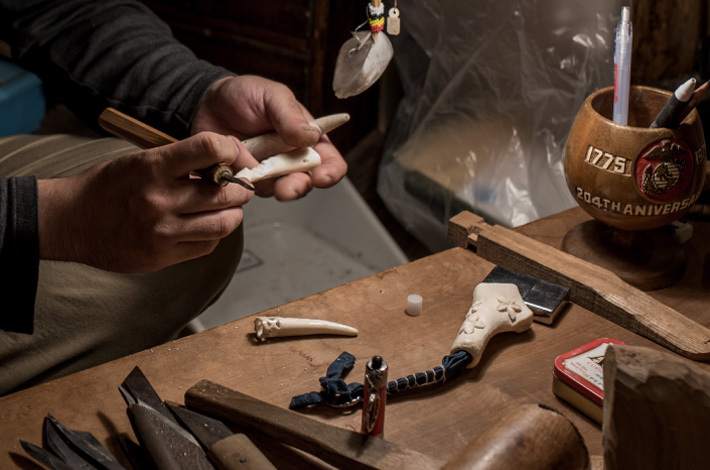 Even now, as he sits at his carving table surrounded by trial materials, his own carvings, and unfinished works, his hand move naturally, carving out something new. It's like interest comes welling up from somewhere and drives him to action. Even when he carves the same thing over and over, he says he puts his heart into changing the pattern each time. 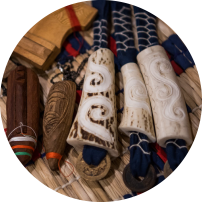 "The patterns include moreu, aiushi, hishi, combination patters, and you can immediately tell when something isn't an Ainu pattern. I don't really think about it all that deeply, or decide in advance. I do it all by feeling, so it's kind of hard to explain. All I can say is, right now I want to improve. That's all there is. " Even so, there are times when he gets blocked trying to draw patterns. It does him no good to overthink things then, so he usually goes out for a mood refresher. He says you have to force yourself to have fun sometimes, and laughs. "Well, I try not to dwell on the hard stuff. Everyone wants to hear how I get my inspiration from nature and stuff. 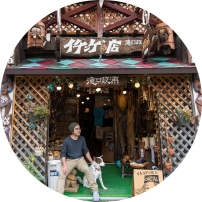 All I want is to be able to carve well, without having to try.I can't really say all that cool-sounding stuff like 'as the inheritor of Ainu culture' or 'as a folk artist' and all," he says and laughs. 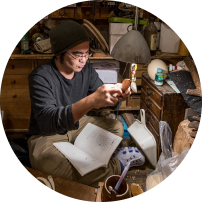 He simply keeps his hands busy every day wanting to improve, wanting to carve well.Perhaps it's Kengo's gentle personality and sincere sentiment that allows the work hidden within the wood to come to light so beautifully.